1)Wash and dry the rice thoroughly. 2)Put all the contents together in a pressure cooker, close the lid without weight on and put on high flame. 3)Wait till steam comes, then put on the weight and simmer the flame. 4)Simmer it for sharp 30 minutes. :- You dont have to worry about the number of whistles. 5)Switch off the gas after 30 minutes and wait for the pressure to relieve, which might take some time. 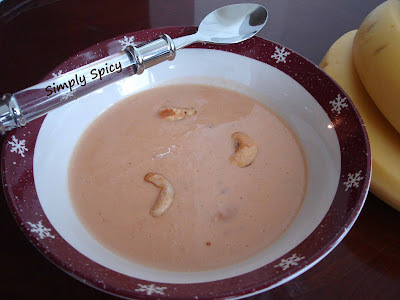 :- Delicious palpayasam is ready to be served. RAJJIIII ENIKKU ITHU ONNU UNDAKKI THARAMO ?